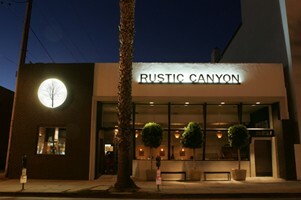 I waited a few weeks to try Rustic Canyon’s new Saturday breakfast/brunch. Frankly I was nervous that the main draw was pastries. If you’re ever in San Francisco and go to Tartine, you’ll understand this fear. When I’m surrounded by luscious looking confections that I know are going to taste as good as they look (a rarity) I want to try everything, but those calories are deadly. Rustic Canyon’s adorable pastry chef, Zoe Nathan, used to work at Tartine and is one of the few people taught to make their famous bread. (Too bad I’m not friends with her and can’t ask her to make it for me for my birthday or something.) You can taste her delicious pastries like lemon pistachio coffee cake, my favorite coffee cake ever, or a new pastry that I didn’t know existed, Kouign Amann, that tasted like an elegant apple fritter with lots of buttery goodness. The Nutella croissant (with or without bananas) was also good. I liked the croissant more than the filling. I think it would have tasted amazing out of the oven. It’s very hard to get a good croissant in LA, and this one was the perfect consistency. Rustic Canyon's owner, Josh Loeb, said that Nathan is such a fan of pastries, that it was her idea to start a Saturday brunch. Thank you, Zoe. DK and I also shared a savory dish: Lily’s Farm Fried Egg Sandwich with Niman Ranch bacon, gruyere, wild arugula and aioli. It was so fresh and satisfying. Next time I want to try the grilled cheese sandwich with pickled ramps, fontina and Niman Ranch bacon. There are enough savory items for those who don’t like pastries or need some savory with their sweet. The slices of frittata were popular, and we had a crispy rosemary potato bread with caramelized onions that rocked. The brunch is very casual—no need to make reservations. There was no wait for a table, so go before it gets super-crowded. It’s also a great place to bring kids and their communal tables in the middle are perfect for large groups of people.